Tissue: A groups of cells which is meant for a specific task is called tissue. Tissue and Division of Labour: In complex organisms, different tasks are carried out by different organs and organ systems. Tissues are the first step towards division of labour in complex organisms. Plant tissues are of two main types, viz. meristematic tissue and permanent tissue. Apical Meristem: Apical meristem is present on root apex, stem apex, leaf buds and flower buds. They are responsible for growth in length, i.e. primary growth. Lateral Meristem: Lateral meristem is present along the side of the stem. They are responsible for growth in girth, i.e. secondary growth. 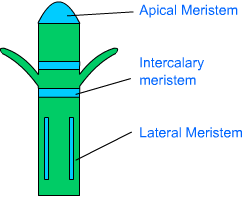 Intercalary Meristem: Intercalary meristem is present at the base of leaf or internodes. They are present on either side of the node. Since cells of meristematic tissue are highly active so they have dense cytoplasm. Vacuole is absent in these cells. Once the cells of meristematic tissue divide to a certain extent, they become specialized for a particular function. This process is called differentiation. Once differentiation is accomplished, the cells lose their capability to divide and the tissue becomes permanent tissue. Permanent tissues are of two types, simple permanent tissue and complex permanent tissue. Simple Permanent Tissue: Simple permanent tissue is composed of similar types of cells. Simple permanent tissues are of three types, viz. parenchyma, collenchyma and sclerenchyma. 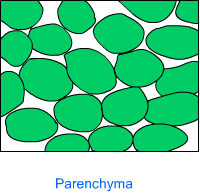 (1) Parenchyma: The cells of parenchyma have thin cell wall. They are loosely packed; with lot of intercellular spaces between them. Parenchyma makes the largest portion of a plant body. Parenchyma mainly works are packing material in plant parts. The main function of parenchyma is to provide support and to store food. In some plant parts, parenchyma has chlorophyll as well. In that case, parenchyma carries out photosynthesis and is then termed as chlorenchyma. In aquatic plants, large air cavities are present in parenchyma. This provides buoyancy to the plant, and then the parenchyma is known as aerenchyma. 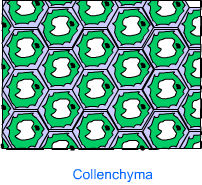 (2) Collenchyma: The cell wall of collenchyma is thickened at corners. Intercellular spaces are very few. Collenchymas provides some degree of structural rigidity with flexibility. Collenchymas is present in leaf stalk; below the epidermis. Due to this, the leaf talk can easily bend but does not break. (3) Sclerenchyma: The cell wall in sclerenchyma is highly thickened all around. The cells are dead and intercellular space is absent. 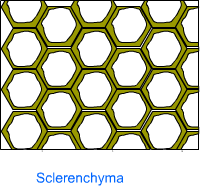 Sclerenchyma provides structural rigidity to plant parts. Bark is composed of sclerenchyma. Another example of sclerenchyma can be seen in the coconut husk. Stomata: The epidermis of leaves has small pores called stomata. A stoma is a composed of two guard cells which regulate the opening and closing of stoma. Stomata facilitates exchange of gases and transpiration. Complex permanent tissue is composed of different types of cells. Complex permanent tissues are of two types, viz. xylem and phloem. Xylem and phloem together make the vascular bundle in plants. Xylem: Xylem is composed of trachieds, vessels, xylem parenchyma and xylem fibres. 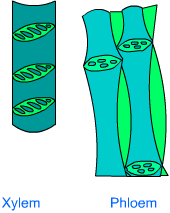 The cells of xylem are dead; except the cells of xylem parenchyma. Trachieds and vessels are tubular structures and thus they provide a channel for conduction of water and minerals. Xylem fibre provides structural support to the tissue. Xylem parenchyma stores food. Phloem: Phloem is composed of sieve tubes, companion cells, phloem fibre and phloem parenchyma. Sieve tubes are tubular cells with perforated walls. Sieve tubes are the conducting elements of phloem. Phloem is responsible for translocation of food in plants. The transport of food in phloem is a two way movement.